Looking toward some millet plants that have been knocked down within a garden. 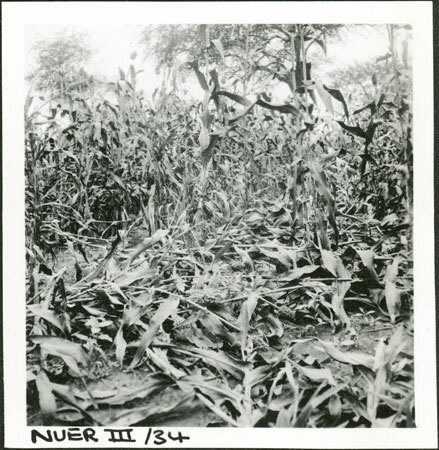 The Nuer cultivated both millet and maize which they harvested towards the end of the rains, a necessary supplement to their milk and meat diet. Note on print reverse ms pencil - "3" & print front border ms ink - "NUER III/34"
Morton, Chris. "Nuer millet garden" Southern Sudan Project (in development). 03 Jan. 2006. Pitt Rivers Museum. <http://southernsudan.prm.ox.ac.uk/details/1998.355.116.2/>.